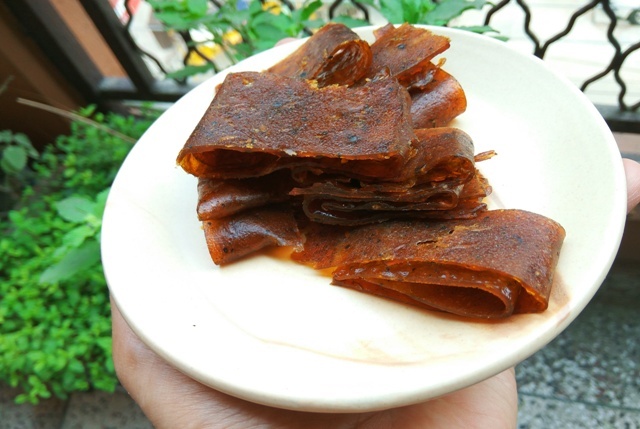 Aam papad has been a hot favorite since childhood. I do not remember how many times I have enjoyed these sweet & tangy mango sheets, though no one from my mom's side ever tried making them at home. 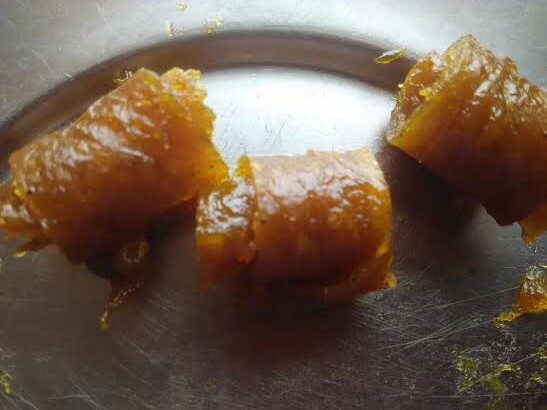 After marriage, my mother in law, who is an awesome cook, made these savory & sweet mango pulp slices for me. 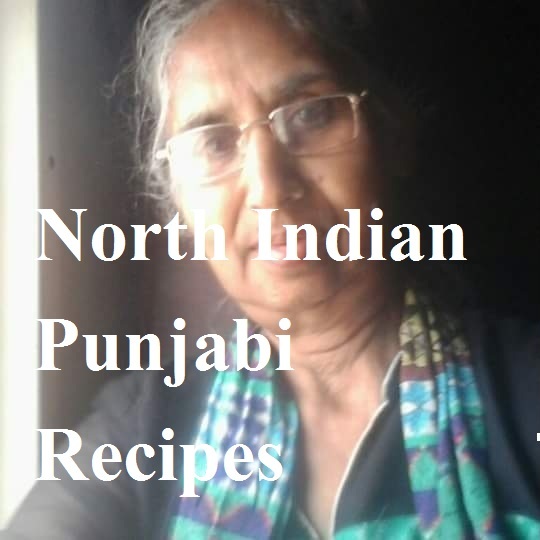 I must tell that she makes the best mango pickle in the world - which is both sweet & sour. She made two buckets full for me after she found that I love aam achaar. Who does not like sweet and tangy mango leather? Our generation has grown up relishing aam papad- wonder what all the present generation is missing out on! So this instant aam sada or papad recipe was born after my dear friend Poonam Bachhav had shared her aam papad post. Her post was the ultimate trigger for me to come up with my own instant Odia version. Poonam is the real Annapurna. I love the way she picks healthy ingredients to cook up deliciousness in the kitchen. 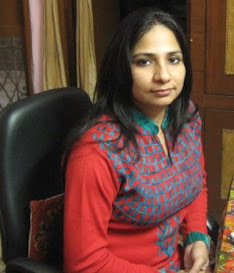 Poonam blogs at Poonam Bachaav dot com. 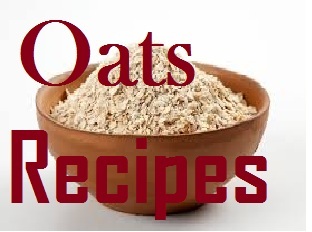 Do visit her blog for more healthy recipes. Not to mention, her clicks are equally awe-inspiring. So let's talk a little about aam sada or aam papad/mango leather. Who does not love aam papad here? You, she, and I have grown up relishing these mango sheets, right? What if I say you can recreate the mango magic at home in an instant. Do not believe my words? Well, instant aam papad is very much possible, thanks to RK's OPOS. Rama Krishnan holds the OPOS trademark, as it is his brainchild. OPOS has revolutionized many Indian kitchens. I follow OPOS in most of my recipes. 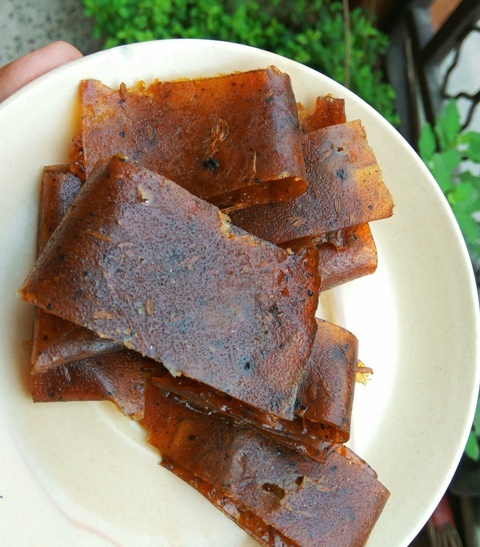 This sugarless aam papad recipe uses jaggery and is spiced up with black salt, pepper, and cumin seeds. Let's come back to the recipe of instant aam papad (sada). The Odiya aam sada is typically a thick form of mango leather with darker hues. My version is thinner and lighter. No sauteeing/no stirring/no white sugar - yes, OPOS makes it this simple! 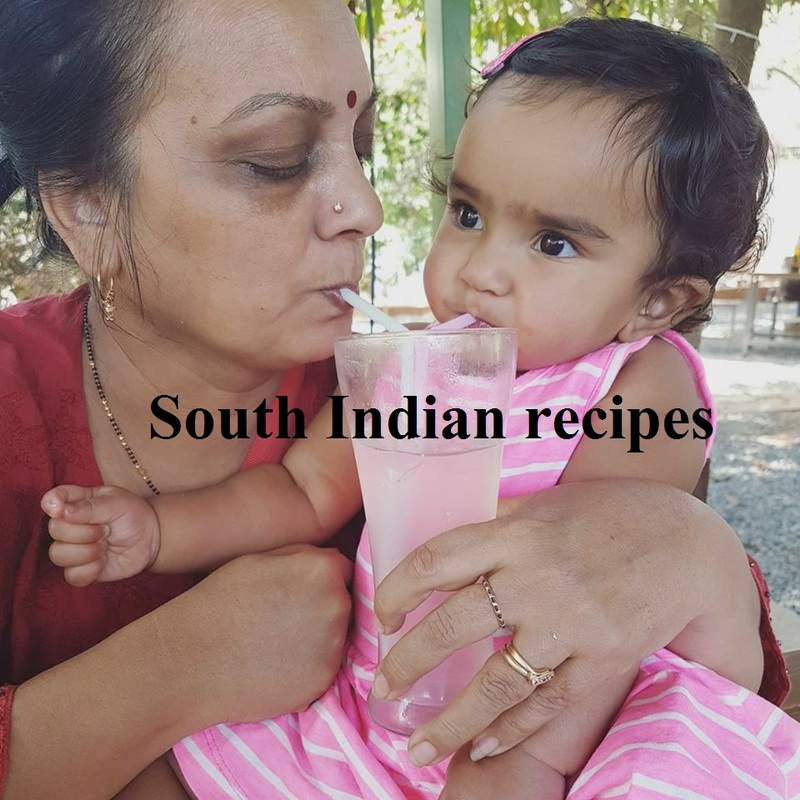 Hello friends, I am back with another Odiya recipe of my MIL. I have been in love with aam papad (read sada in Odia) since childhood. After my marriage, my favorite culinary queen(my MIL) opened up before me her culinary treats. I love everything she cooks, and aam sada is one such mango recipe that my MIL holds specialization in. She has been a homemaker all through her life. My Odia posts are just a way of thanking her and bringing her culinary talent before the wider world. Thank you for everyone for liking my posts. Let's come back to my MIL's aam sada recipe that I have adapted to my taste and style. Sweetened with jaggery and spiced up with black salt, black pepper, and jeera (cumin seeds), this subtly sweet 'n tangy aam papad is instant, thanks to OPOS. Cut mangoes into small pieces or you may use a chopper. Add chopped mango slices as the bottom layer. Top it with jaggery powder. Next layer is of black salt, black pepper, and jeera. Close the cooker lid with weight (whistle) and cook for 7 mins or 12 whistles. I went for 15 whistles though, but 12 should be good too. Initially, I turned off the flame after 5 minutes -10 whistles. When I opened the pressure cooker, I felt it needed little more cooking, so closed the lid and cooked for 5 more whistles. Release pressure and open the cooker. Mix and mash everything. Take a greased plate. I needed two greased plates for this amount. The idea is to spread the puree thin. Use a spoon or spatula to spread mango puree evenly on the plater. Keep it under the fan for one hour. Then take it out for sun-drying. Cover the plates with a muslin or cotton cloth and let is rest in the sun for at least 2 days. After 2 days, your mango aam sada is ready to be relished. 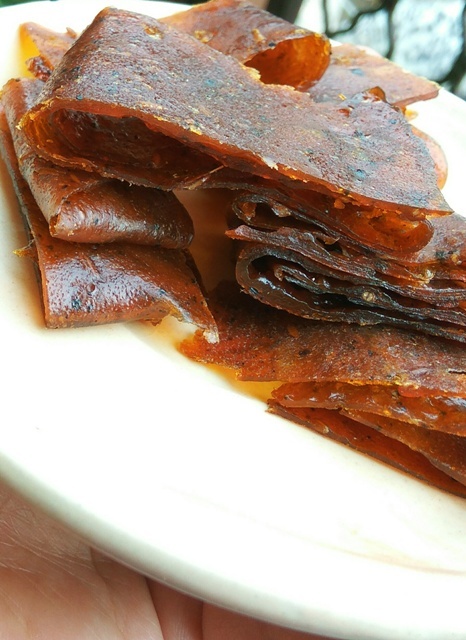 Cut into slices and relish these tasty tangy aam papad bites! You'll never have to buy aam papad from the market again. Mix sugar, salt with the slices and run into a blender. Take a pan and pour this mango puree into it. Stir constantly on a slow to medium flame for 10 mins or until the mixture has thickened and forms almost like a mass. Take out the mixture in a greased plate. Pat with a spatula or spoon and flatten it like a chapati. Sun dry it for a day or two. Cut into slices and relish these tasty bites! Enjoy these home made aam papad or mango slices. 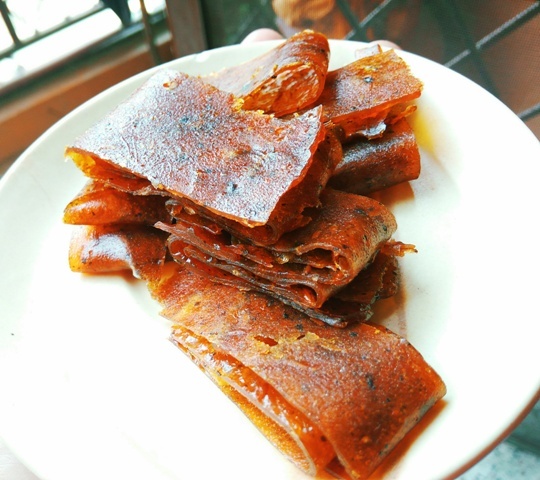 The spiced aam papad looks so inviting Ravneet ! Loved this instant version of yours ..lovely share ! The aam sada are yummy. Loved by everyone in the family. Thanks for stopping by, Poonam.